Today I am going to review a Sheet Mask from Famous Online Store Skin18.Com . 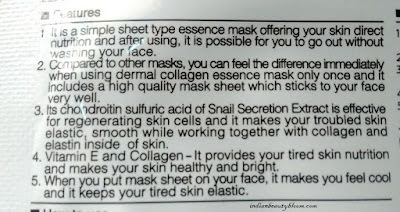 It’s Dermal Snail Collagen Essence Mask . Skin18.Com is a Hongkong based online store which has variety of Korean Skin Care products . I have used and reviewed various products from this store . This Dermal Snail Collagen Essence Mask has snail extract & Collagen and it helps to moisturize & regenerate the skin . Also contains Vitamin E which is good for skin . 1. Wash the face and make it dry . 2. 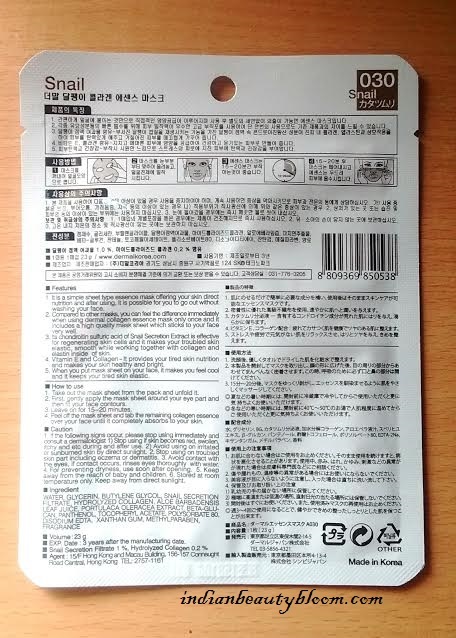 Open the sheet mask and put on your face avoiding the eyes and mouth area . 3. Leave it for 15 – 20 minutes . 4. After 20 minutes take it off and massage the face with remaining moisturizer on face . 1. Easy to use . 2. Travel friendly , can be easily carried in a bag or purse and used when ever required . 3.Sticks to skin and does not falls off . 4. Suitable for all skin type , even Oily skin beauties can also try . 5. Completely moisturizes and hydrates the skin . 6. Product packaging is good , a single sheet comes in a single pack so good as it’s meant for a single usage . 7. 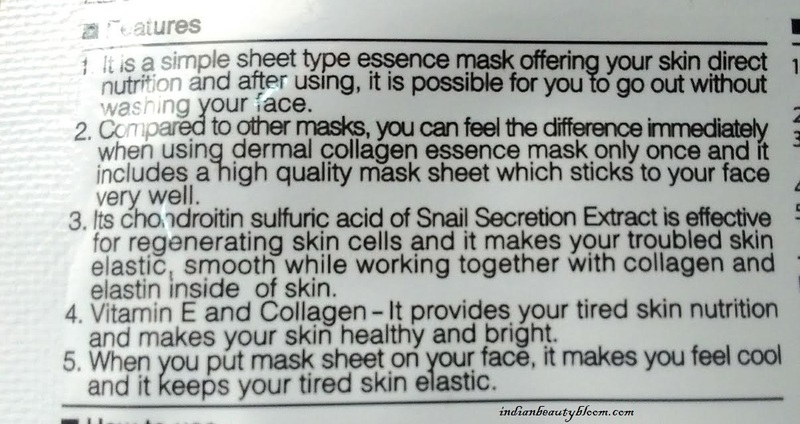 Contains Vitamin E , Collagen & Snail Extract , all good for skin . 8. 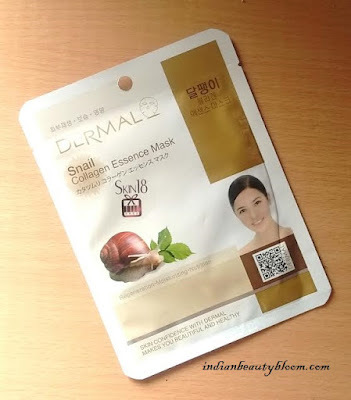 Snail Extract helps in regenerating skin cells and makes skin smooth & elastic . 9. Good shelf life of 3 years . 1.Availability might be an issue as available on online store of Skin18 and not available locally . 2. Not a chemical free product , contains Paraben . 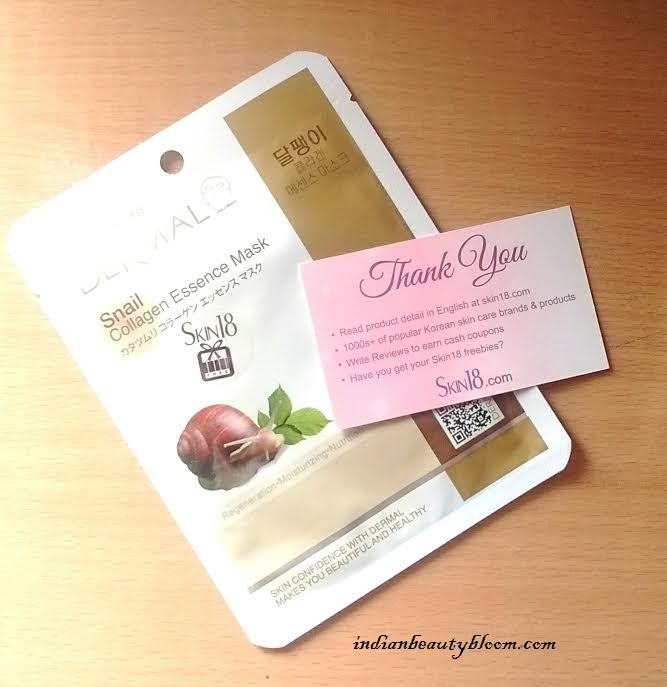 I have used several sheet masks from Skin18 before ,all were good , this one is also good. 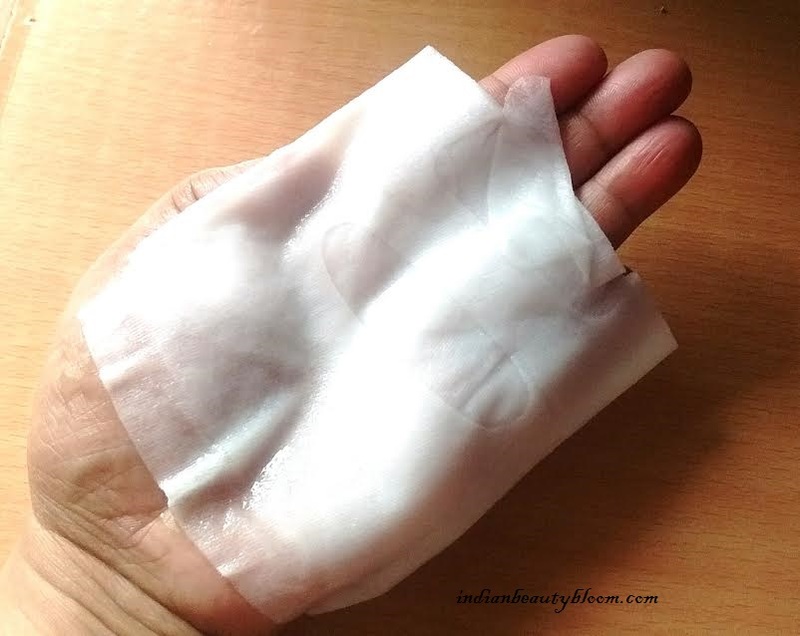 It’s very easy to use , in fact one of the easiest way for a good skin care routine . One feels refreshed after using these masks . It does hydrates and moisturizes the skin and one does not needs to use a moisturizer after using it .